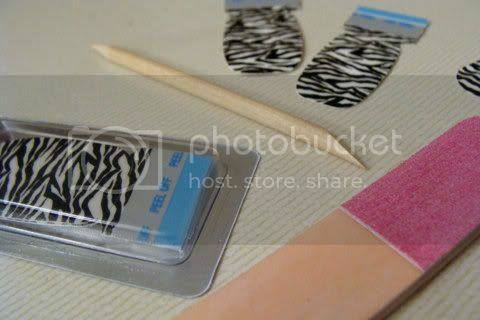 I recently won the zebra print set of the infamous Sally Hansen Salon Effects Nail Polish Strips from my friend Melanie of Those Things She Said. Don't they look pretty? I don't think I've ever had this design on my nails before! They were real easy to put on but it still took some time to complete both hands. The aftermath of the trimming is my only complaint. I find that where I trimmed off the excess strips are a bit rough and I'm afraid they might catch on to things. I could file them more but I don't want to cause the strips to peel away (which a couple of them already started to do, though it is unnoticeable.). The box says the strips last up to 10 days, so we'll see! Overall I think it's a fun invention and I love that it comes with everything needed to prep your nail and apply the strips! Thanks again, Melanie! Have you used these strips before? How did they work for you? How long did they last?